If you own a dog or have ever loved a dog, put Stephen Huneck's Dog Chapel in St. Johnsbury, Vermont, at the top of your list of dog-friendly places to visit in New England. Take your dog along if you can. Whether or not you make your pup sit in a pew, his prayers will be answered when he discovers the nature trails, swimming ponds and other delights of the 150 scenic acres that surround the chapel on Dog Mountain. Even if you're not a dog person, you'll be impressed not only by the uniquely detailed chapel built by artist Stephen Huneck, who died tragically in 2010, but by the emotion and devotion that dogs evoke in so many people who have chosen to share their lives with a furry friend. Why did Stephen Huneck build the Dog Chapel? And how can you honor the canine companions who have touched your heart? This guide to Stephen Huneck's Dog Chapel has answers and a preview of this heavenly place for dogs and their people. 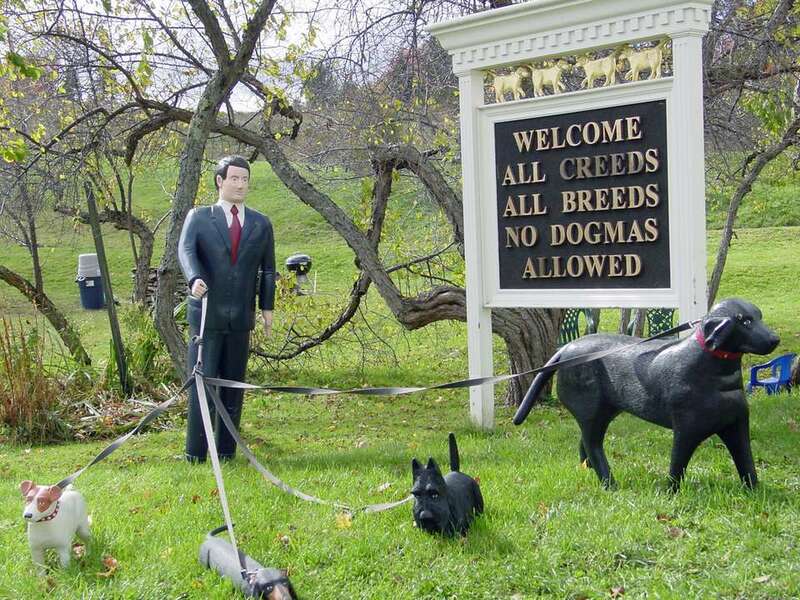 "Welcome All Creeds All Breeds No Dogmas Allowed"
It's a clear message that all dogs—and all dog owners—are welcome here. The Dog Chapel and Dog Mountain grounds are open free to visitors daily year-round. As of 2018, the Stephen Huneck Gallery at Dog Mountain is open Thursday through Monday. While it is designed to resemble a small Vermont village church, the Dog Chapel and its environs are a non-denominational place in which to celebrate the spiritual connection between dogs and people. Whatever your religious beliefs, and whatever the color, size, breed and slobber factor of your dog, the one thing you'll be sure of by the time you leave the Dog Chapel is that heavenly rewards await all faithful, four-legged companions when their time on Earth is through. Remembrance Walls inside the Dog Chapel are your place to post photos of and letters to beloved dogs that have died. Whether or not you've ever had a special bond with a dog, you can't help but be touched by the love and respect conveyed in the words of dog owners who have had to say "good-bye" to a beloved pet. "Sweet Atlas, you taught me how to love !! I look forward to seeing you again. Love, Mommy"
"To our beautiful 'girl'—Curry. You were the best Lab a family could ever want. We miss your tail wags, smiles and sweet nature. You were such a devoted friend. We'll look forward to seeing you again some day. Love, Mom & Dad"
"Smitty, Thanks for sharing your love and happiness—we miss you—may you run forever in the Vermont Hills." You can leave behind your own tribute to a dog (or even a cat) when you visit. Why Build a Dog Chapel? With its dog-themed stained glass windows and hand-carved dog pews and sculptures, the Dog Chapel is more than just a place to remember and celebrate the companionship of canines. It is a majestic and one-of-a-kind work of art. Why did Vermont artist Stephen Huneck build the Dog Chapel? The "wild idea" came to him shortly after he returned home with his wife and three dogs following a serious accident that left him suffering with Adult Respiratory Distress Syndrome and in a coma for two months. At the Dog Chapel website, you can read the compelling story of how Huneck's illness and a near-death experience profoundly inspired him to show appreciation for basic things we often take for granted. "I look at this chapel as the largest artwork of my life, and my most personal," stated Huneck. Dogs were already a subject of interest to the artist, known for his whimsical wood sculptures, furniture and woodcut prints, and they came to dominate his works, which are exhibited and sold in a gallery on the Dog Chapel property. In this close-up photo of one of the stained glass windows in Stephen Huneck's Dog Chapel, you'll see how dogs are celebrated in every detail of this captivating chapel. While no regular services are held, visitors and their dogs are invited to pause inside the chapel. It's the perfect place to give thanks for all of those sloppy kisses, waiting-at-the-door greetings, barked alerts and shared walks in the woods and to forgive all of those muddy footprints on the kitchen floor and accidents on the carpet. If you pack a picnic, the Dog Chapel can be a perfect day trip destination for you and your dog. While visiting the chapel and art gallery may be highlights for you, your dog, quite frankly, will be anxious for an unleashed outdoor romp. Following the equally tragic death of Huneck's wife, Gwen, a non-profit was established to continue to make the 150-acre Dog Mountain property where the gallery and the Dog Chapel are located available for those looking for a picturesque place to walk and play with their dogs. 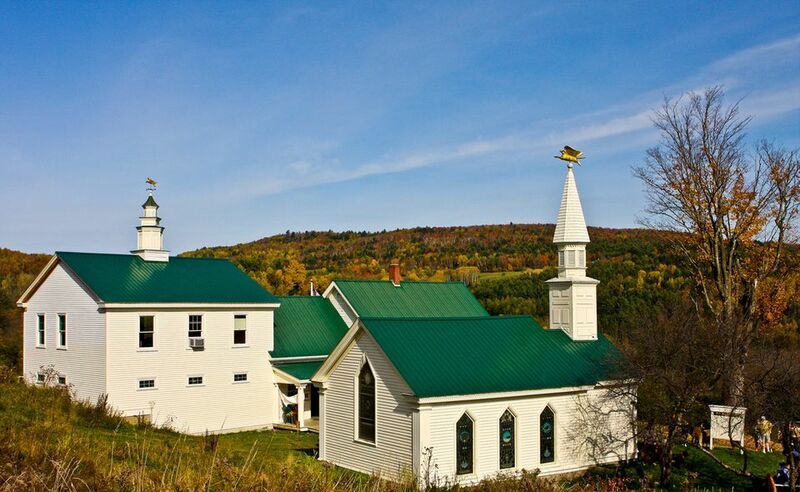 St. Johnsbury is located in Vermont's Northeast Kingdom, one of New England's most unspoiled regions. While this area is wonderfully wild and scenic, it is also amazingly easy to reach via Interstate 91. St. Johnsbury is located just under three hours from Boston and a bit over three hours from Hartford. Dogs are great companions to people, but most dogs like to play with other dogs once in a while, too. If your furry friend is a social pup, one of the beauties of planning a trip to the Dog Chapel in Vermont is that you're almost guaranteed to meet up with some other dogs while you're there. If you want to be absolutely certain that you'll find playmates for your pooch, visit the Dog Chapel during the annual summer or fall Dog Party. In the past few years, hundreds of dogs and their owners have come from as far away as Alaska to enjoy a day of activities. Has walking the dog become a chore, rather than a joy? Do you find yourself apologizing to your puppy that you can't play right now? A trip to the Dog Chapel in St. Johnsbury, Vermont, can be a treat and a bonding opportunity for you both. You'll definitely see a look of gratitude in those soulful, round eyes. If you've recently lost a pet dog, the Dog Chapel is also a place to find comfort and solace and to honor the memory of your furry family member. You may find that you enjoy visiting the Dog Chapel even if you've never owned a dog. It's a unique work of artistry in a lovely setting where you can't help but be reminded to cherish life, relationships, and simple pleasures. All those who we love—including our animal companions—live on as long as we hold fond memories in our hearts.